I got a phone call from my neighbour who's just come out of hospital (stay tuned for a get well soon card) & she wanted to share the happy news that her daughter is pregnant! So exciting!! So I thought I'd make her a card & use the Global Design Project sketch & also the Just Add Ink (Tags) challenges to give me some inspiration. I've also done a really clean & simple (CAS) card, which is a bit out of my comfort zone but I'm pretty happy with it! I have used a Thick Whisper White cardstock base, stamped with the Playful Backgrounds stamp set in Soft Saffron & Bermuda Bay inks. I have wrapped Gold Thread around the card four times & fastened in the middle before adding a Gold Bow Paper Clip & some Gold Metallic Enamel Shapes. I have Gold heat embossed the sentiment from the Made With Love stamp set onto another piece of Thick Whisper White & cut out with the Classic Label Punch. On the inside I have stamped the striped onsie from the Made With Love stamp set in So Saffron & Gold heat embossed another sentiment from the same stamp set. 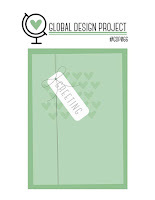 I have entered this card into the Global Design Project Sketch Challenge. I have also entered this card into the Just Add Ink - Just Add Tags Challenge. And I have added this card into the Crazy Crafters Team Project Highlights for this week. You can see all the entries & vote for your favourites from 7.30pm, Friday 16 December.